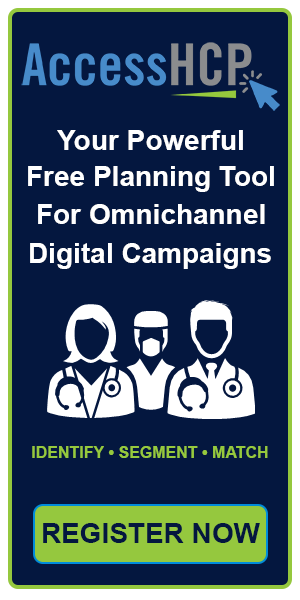 AccessHCP is an exciting new way for healthcare marketers to access, segment, analyze, and license the data they need to fuel their multi-channel HCP campaigns. This powerful, cloud-based platform allows you to have full, do-it-yourself access to over 3 million US healthcare professionals and their associated contact, demographic, firmographic, and professional data. Signing up for an account is free. Once you’re in the platform, simply set up your campaign specific filters and upload any additional lists that you would like to either use as a match or suppression file. You’ll have full control over dozens of segmentation filters and options. Your data analysis will run in seconds, and you’ll be presented with data counts and a preview of the individual records. You can also leverage our Clinical Indicator platform to filter your analysis based on the specific prescribing, diagnosis and procedure behavior of each HCP. AccessHCP revolutionizes healthcare marketers’ ability to access and analyze high quality HCP data and ensures the highest efficiency, timeliness, and ROI against unique marketing objectives. Please click the button to the right to create a free account on AccessHCP today & start getting immediate access to the data you need to fuel your multi-channel engagement programs.